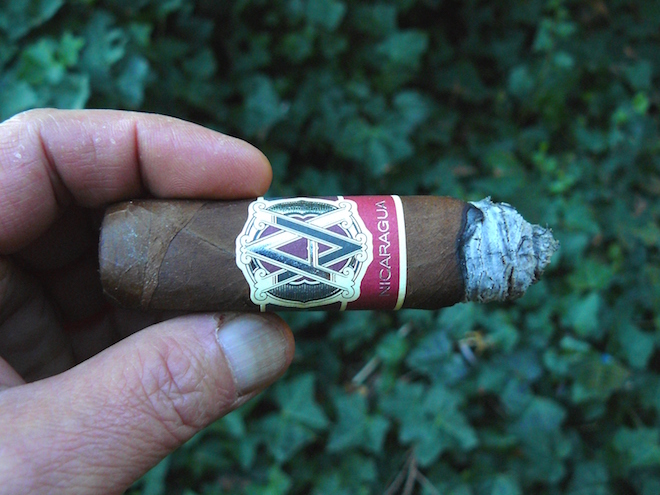 AVO Cigars announced the launch of its new Syncro Nicaragua line at last year’s IPCPR trade show, and has since garnered a lot of attention and praise, so of course, in keeping with my usual tardiness in staying current with the new, I now bring this review to you a full year later. 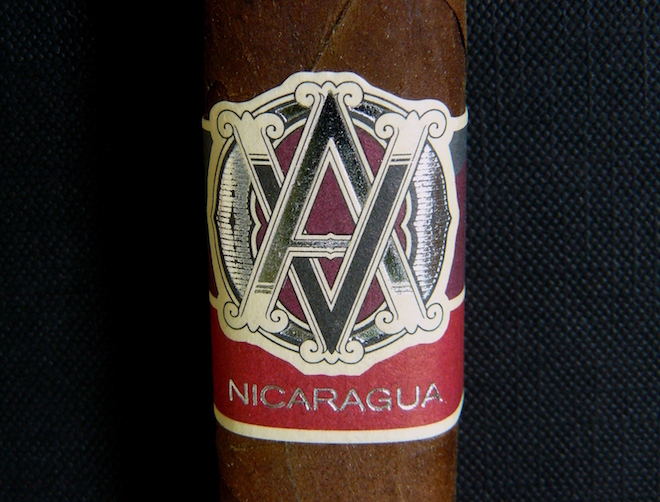 The AVO Syncro Nicaragua is the first regular production line from the company that utilizes both a box pressed finish and Nicaraguan tobacco. Although Nicaragua is prominent in the name of cigar, it is only one of four different countries that contribute to the blend. I can’t smoke a country, however, so whatever they choose to call their cigar is of little concern to me. Blended by Davidoff’s Master Blender Henke Kelner, it is produced at their OK cigar factory in the Dominican Republic, and come in four sizes: Short Robusto 4 x 52, Robusto 5 x 50, Toro 6 x 54, and Special Toro 6 x 60. The cigar I am reviewing today is the Toro, and came to me several months ago by way of our great friends over at Cuenca Cigars. Thanks Ana! The AVO Syncro Nicaragua comes draped in a reddish milk chocolate brown wrapper that is velvety to the touch and shows a few flattened veins and seams than range from nearly invisible to quite noticeable. 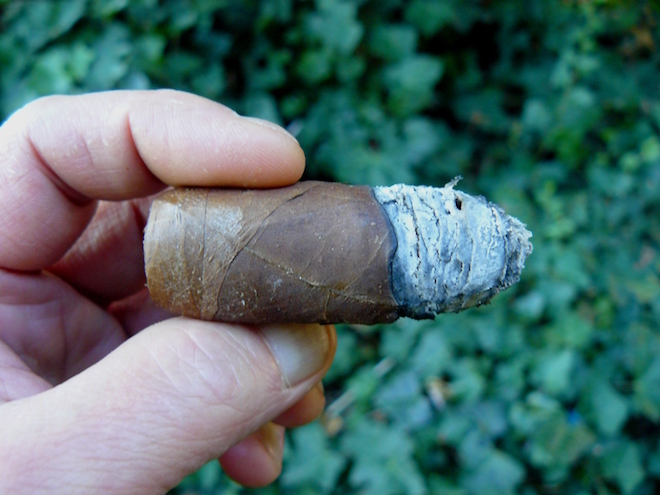 The cigar is well packed down to the foot, where it is a bit soft due to a couple of voids in the filler. The band sports a medley of gray, brick red, maroon, beige, and silver, and is quite attractive without being flashy. The scent off of the wrapper is a lightly earthy tobacco, while the foot adds peat and spice notes. The cut reveals a snug draw that doesn’t show much other than a sweet spice. Upon lighting, the AVO Syncro Nicaragua immediately opens up on the draw to a more desirable level, displaying smooth earthy tobacco and toasty oak in a mild framework. The burn line is sharp and at a bit of a slant, leaving behind a solid light gray ash that lasts for a good 1 ½ “. There is no pepper to speak of on the palate, but it does show up on the retrohale, along with an easy-going woodiness, as the body edges closer to medium. The AVO Syncro enters its second portion with an uptick in flavor, introducing some lightly sweetened coffee and bread notes. The burn has completely evened itself out and there is a brightness to the flavors on the finish. Sweet spice notes play on the tongue upon entry, but always last for long. What I’m really enjoying is the sweet woody aroma that emerges as I take each puff. 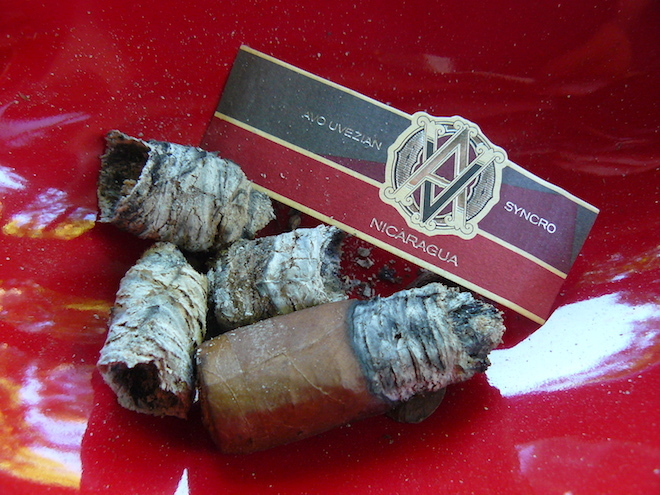 As I get into the final third of the AVO Syncro Nicaragua, it has maintained its smooth medium body and is now showing a bit more pepper presence. The coffee has turned more bitter than sweet, while the other flavors have not changed up much. 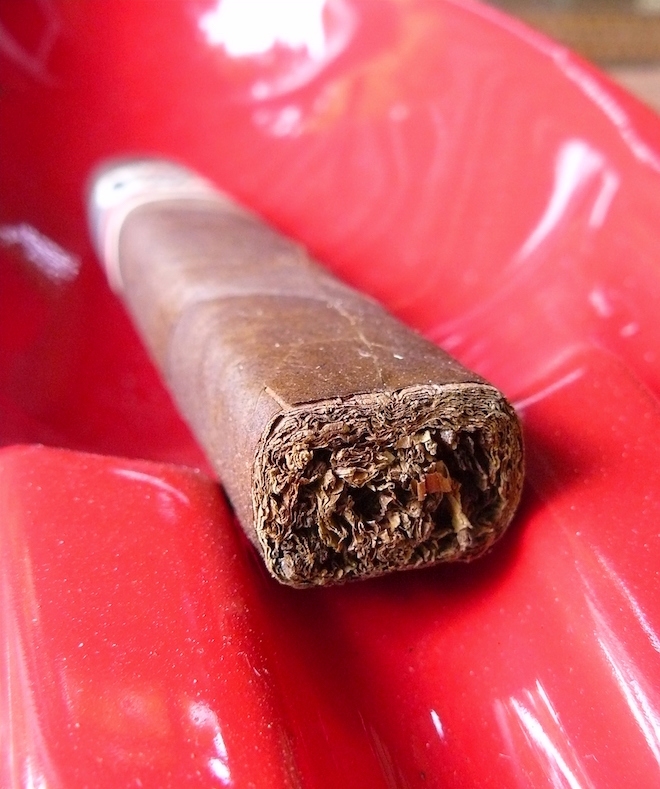 With the flavors starting to flatten out, I put the cigar down with about 1 ¼” remaining, still at a solid medium body and at a low-medium in terms of strength. 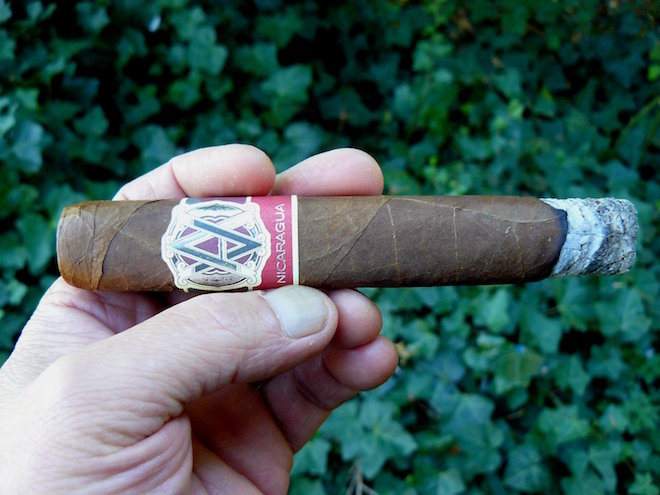 Although it didn’t show a whole lot of complexity, I still found the AVO Syncro Nicaragua quite enjoyable, never overwhelming in terms of strength or body, and with excellent construction and – for the most part – burn, requiring nothing more than a couple of very minor touch-ups. It did smoke a little quickly for me, but that may be due to the breezy conditions I was in today. I will say that it has a lot of competition in its $10 price range, but I would have no problem picking one up as I come upon them. I did smoke both the Special Toro and Short Robusto previously, and found the Toro size to be a pretty happy medium between sizes, as the Special Toro – as is typical for me – seemed to be a little flat in its flavors, and the Short Robusto was, well, a little too short. 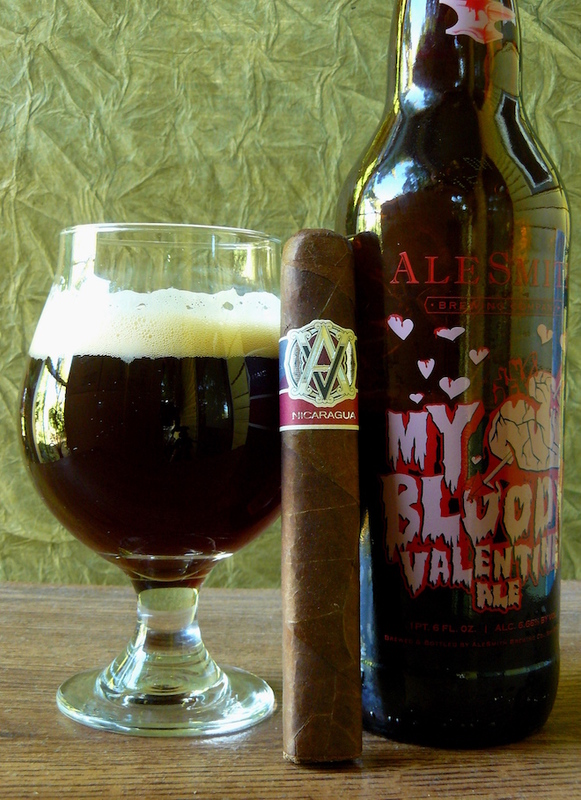 My Bloody Valentine comes from San Diego brewery AleSmith, and as the name implies, is a seasonal red ale that comes out each year in time for Valentine’s Day. Pouring a somewhat murky rusty reddish brown, it shows a medium body with a slight caramel sweetness and dark fruits, this one may have been just a bit over the hill, but still paired very well with the AVO Syncro. A big fruity Imperial IPA or strong ale might be an even better match, and a smooth Highland Scotch or a red wine such as a Merlot or Syrah/Shiraz would also be a great pairing. Very good write up Jumpin Jeff. That $10 category is a very tough club to join, the cigar has to deliver at that price point now with all the competition.